Here are the recommended Greenkeeping tasks for March maintenance work for the Performance Greens Program. Carrying out maintenance is of course dependent on the weather and underlying conditions. As I write this, we seem to have escaped any prolonged real winter weather, so growth should get going reasonably quickly. In addition, most parts haven’t been overly wet, so surface moisture shouldn’t be too bad either. However, greens in transition with significant Poa and/or thatch build up have been hit hard in some cases by diseases like fusarium, but as it warms up the work this month should see that receding fast. It’s important to keep an eye on the green though as disease outbreaks can spread quickly when the weather turns mild again. I’m not averse to getting the sprayer out to spot treat these outbreaks with fungicide if totally necessary. Blanket sprays and preventative sprays have no place in the Performance Greens Program, they do much more harm than good, so vigilance is important. Mowing should have been going on through the winter months when conditions allowed to keep the grass topped at 8mm or so. With a bit of growth now, the height of cut can start to come down gradually from 8mm to 7mm and then hopefully to 6mm as we approach the end of the month. The further North you are the later this might be, but if you’ve kept the green trimmed at 8mm throughout the winter period and not let the grass get too long at any point then this should be a fairly simple and painless transition. Step up the mowing frequency now to at least weekly and more if you think it needs it. Greens that are still in the recovery phase probably will see occasional outbreaks of fusarium when the weather is mild and you shouldn’t be too complacent about these if your green is still thatchy, annual meadow grass dominated and/or apt to stay wet and soft at the surface. Spot treatments of fungicide are still recommended if needed. 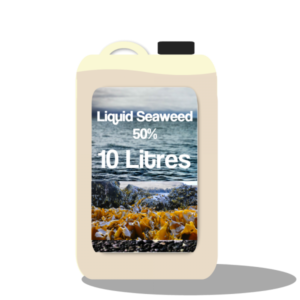 Super Concentrated Seaweed Liquid with its plethora of trace elements and natural plant inoculants is an essential helper in the soil in deep winter. Trace elements like Copper and Zinc are known to help grass plants fend off attacks from fusarium and other fungal pathogens and its bio-stimulant properties helps to keep the microbe population growing and active. You can quite happily apply this all year round as a biostimulant. Worm casts left on the surface or smeared into the turf with the mower become ideal seedbeds for weeds next year, so try to make sure you clear them using a switch or brush frequently when conditions allow. We have over 50 species of earthworm and only 3 surface feeding species’ produce surface casts. They feed surface detritus, taking it back underground, helping to recycle it into soil. If you leave debris on the surface you will get more casting worms, so try to keep it clean. Worm killers are mostly unavailable now thankfully, as they did more harm than good, so it comes down to suppressing worm activity if they are causing a nuisance. Light applications of sulphur liquid or lentils (granules) can have a good suppressant effect. I’m also experimenting with some other treatments at the moment and will hopefully have further recommendations to make before the next worm onslaught in the autumn. March is the last month before opening day for catching up with this, most important of deep aeration jobs. By deep, I mean 125 to 200mm, with tines that can get in to the upper limit of this range being preferred. Beyond the end of March it’s too disruptive and the narrow slits it makes in the turf can open up and discolour in the drier months if it’s continued too far into the spring. Try to get the last couple of passes in now and the green will reap the benefits in terms of moisture penetration and movement in the soil all through the season coming. This is the beginning of the optimum period for Compost Tea application. Moss has been a continuing problem for many readers. 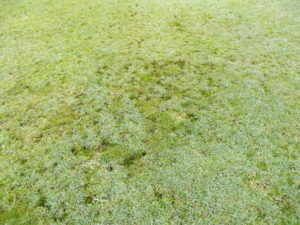 Moss takes hold in any space that is left in the sward, so until your green has fully transitioned into a healthy, perennial dominated one, this will continue to be a problem, albeit decreasingly so. Now is the time to hit moss hard with a full dose of Liquid Chelated Iron. This should be followed up by another half rate application after 14 days. Scarifying can commence once the moss has been killed off. With many greens showing very high locked up iron levels, which is made worse by the use of lawn sand or sulphate of iron based moss killers (for every 100 grams of product you apply 70 grams of salt which is detrimental to water and nutrient uptake in the plants), it really isn’t helpful to add more. So, Chelated Liquid Iron is the way to go with this, as it is freely available to the plants (not locked up in the soil) and isn’t acidic at application. This is the key time to get growth underway with an application of starter fertiliser preferably in granular form. To get the grass growing and to boost the underlying microbial activity I recommend an application of Soluble Compressed Molasses. This is a 10-0-4 Low Salt Organic Granular containing slow release nutrients, fulvic and humic acids and amino acids combining slow release nutrition with excellent bio-stimulant and soil building properties. Late March is also the right time to make adjustments to the underlying soil nutrition holding ability if needed. In a lot of cases greens are acidic, which makes a lot of the soil bound nutrition just that…bound so that it isn’t readily available to the plants. The Base Saturation of Cations is a measure of how well your green is set up to achieve optimum nutrient availability for plants and is included in my soil analysis service. If you have a current or recent soil analysis report I might be able to use it to advise you further on the requirement for base saturation corrections, but barring that you can easily take advantage of my done for you soil analysis and greenkeeping schedule service here. 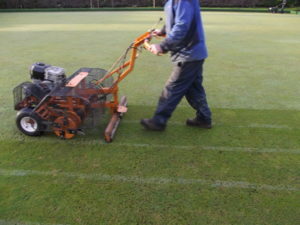 With the new season about to start, many clubs are coming round to the fact that they’ve been chasing symptoms for years and not tackling the underlying causes of poor green performance. Why not make this the year you finally commit fully to achieving a Performance Bowling Green? The ebook that’s caused all the fuss is well under the price of a bag of fertiliser!…more here. Opening Day Preparation: Getting the mower ready. 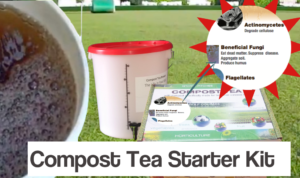 Hi John , I’m brewing compost tea with the 25 LTR brewing starter kit which we acquired from you , how much CMS shoot and liquid seaweed should be added to each 25 LTR brew ? Look forward to hearing from you Kevin. Put 200ml of CMS Shoot in the brewer as a food source. Then when applying to the green you can tank mix any of the Bio-Stimulants with the finished compost tea. I suggest 1.5 litres of CMS Shoot per bowling green in summer and 1.5 litres of Liquid Seaweed in shoulder months (Spring/Autumn).